Racking Wine – No Lifting Carboys, Degas Easily with The All In One Wine Pump. Racking Wine is among one of the most important things we can do as winemakers to clarify our wines naturally. It is extremely important after primary fermentation to transfer off the yeast beds, so not to add any sour taste to our existing wine. You can degas easily as you rack your wine, using the All In One Wine Pump. The All In One Wine Pump is extremely portable – and light and very dependable to make your life easier. While adding any chemicals ( sorbate , sulfite ,etc.) 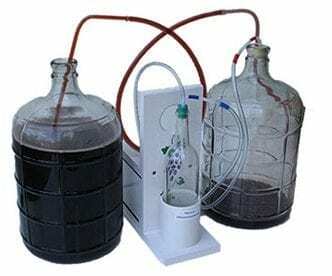 it is best to put the chemicals in the carboy that you are transferring into then start your transfer. This process will make sure that all your wine is mixed properly. When racking you must go into a glass vessel in order to be able to start a vacuum and have the process work. While you are racking your wine you will notice that there is foam on top of your wine. This is normal – this is CO2 that is being removed out of your wine. Typically it only takes several transfers to remove most all your CO2 using the All In One Wine Pump. There is no need to do several racking’s back to back if you have the pump from the beginning of your wine making process. If you have a smaller vessel that you are going into – make sure that the vessel is above the one that you are pulling from as gravity will take over and continue to flow the wine. You can always pinch off the racking hose as you manually transfer the bung assembly into another waiting carboy.